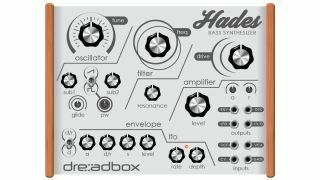 Dreadbox, maker of the Erebus paraphonic synth, has announced a new bass synthesizer called Hades. With only a rendered image currently available, we can see that Hades features a single oscillator and two sub oscillators. Like the Erebus, it also includes a semi-modular patch matrix. We're not sure of a release date just yet, but Dreadbox has already suggested a retail price of $299. For more information check out the Hades web page.